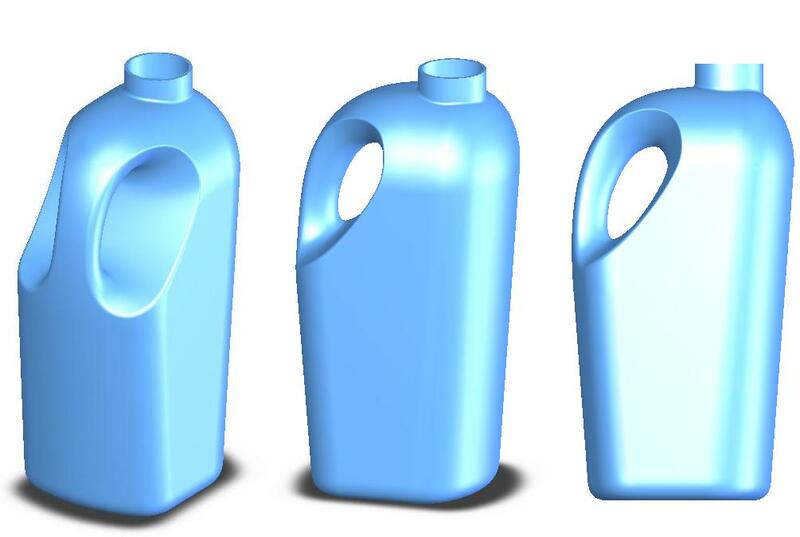 Bottle Handle Curves- Need Help! I am almost new to Solidworks, but necesity got me going fast. THANKS A LOT for any suggestions. Don't see an image. 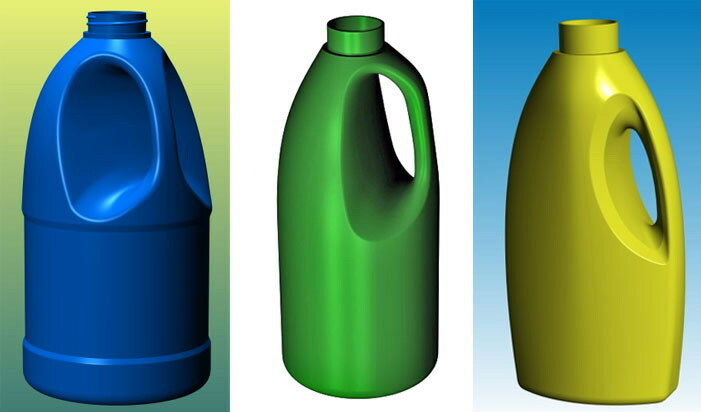 www.dimontegroup.com has tutorials, one shows how to do a typical laundry detergent bottle surfaced in SW along with other excellent strategies for modeling in SW.
thanks skinny, i'm going to check those tutorials. Anyway, i'll try to put some images as soon as i learn to do that. These are the curves i refer to. What would be the best approach. Could anyone make an example. The dimonte tutorial is exactly what you need, goes through the whole bottle of that type. Actually more steps than I thought it would be. Basically, start with large surfaces first, then work to smaller, then do small detail radii/fillets last. A general strategy I use is to create sketches of the 3 views of the bottle at the top of your feature tree. Fully define all the relationships with constraints and dimensions. Then, as you build different features, copy parts of those initial sketches into new sketches. This way, if you need to change something, you just change the first sketches and the changes will cascade throughout your feature tree. Also, you really only have to build have of the bottle or handle, then the last step is just to mirror it. Have a look at the attachment. I can send you the SW2005 file, but it's too large to upload here. There is no trick or 'best way', you just have to get your head around modelling with surfaces and using solidworks functions. Hi guys. Thanks you all for your kindly advices and replays. Hey guys, look what I did. Thanks to you all. 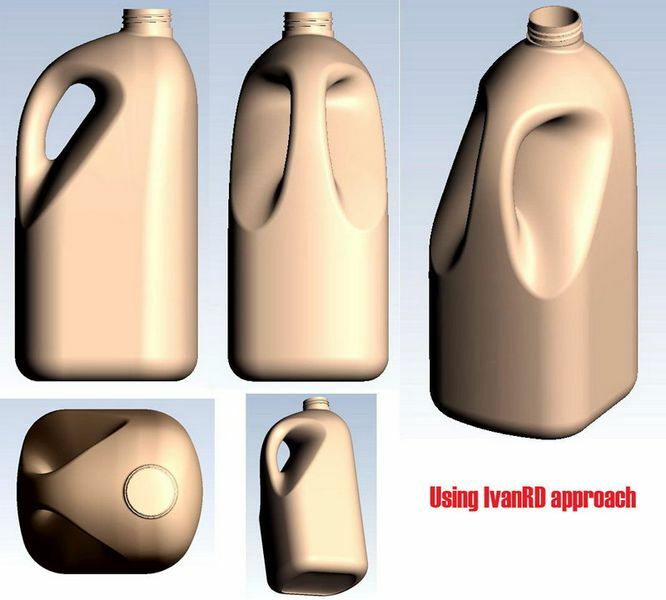 Specially to IvanRD, because I used his file to learn the way to do the handle. Anyway I believe that with SW you have to be tricky because sometimes it does not works as you expect. Thanks a lot. I,'ll be posting some special cases as this one. 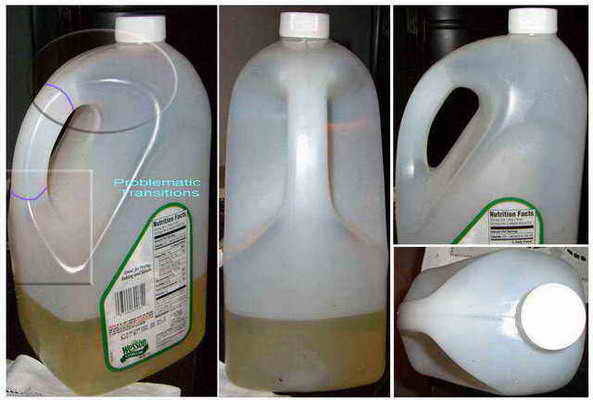 Some plastic bottles are very complex. please upload the sldpart file here! I want to have a look. The SW file is near 6 mb, so if you have a e-mail address i can send you the file. Can someone email me the file? My email address is puhrot@gmail.com.